Nick Lewis on a sunrise run on the Cumberland Trail, Chattanooga. Photo by Tobias MacPhee/Tandemstock. It’s not easy to fit three six-foot-tall men into a compact-sized Toyota Matrix already packed to the gills with camping and running gear. But in 2011, Fynn Glover had a mission. A moppy-haired, then-23-year-old trail runner from Chattanooga, Tennessee, Glover wanted to explore how outdoor recreation could help young people live better lives. He quit his internship at a hedge-fund firm to hit the road. Joined by his youngest brother, Ry, then 20, and his college roommate, Russell Himelein, then 23, the three men plotted a road trip across North America. Between epic trail runs and days on the road, they stopped at college campuses, clipboards in tow, to interview their fellow members of Generation Y about their relationships with the outdoors. In other words, Glover wanted to ask: Could outdoor recreation change lives? It was a question that his hometown of Chattanooga had been asking itself since before he was born. Today, Chattanooga might seem like the most natural place in the world for someone like Fynn Glover to have come from. Often dubbed the “Boulder of the East,” Chattanooga has 56 trailheads within half an hour of downtown—in fact, nearly three times as many as Boulder. Swaths of mountainous terrain surround the city, a labyrinth of bluffs, gorges, creeks, waterfalls and sandstone crags. The Tennessee River cuts through the city like a broad, gleaming ribbon. At the end of the day, the silhouettes of kayakers and stand-up paddlers drift gently down its waters toward the orange glow of sunset. It’s a midsize city—about 170,000 people—with a low cost of living and good job opportunities. Boasting many of the trappings of its hip trail-town counterparts like Flagstaff, Portland and Asheville, the town features a vibrant arts district, a recent explosion of new restaurants and bars downtown, a public bike-sharing program, state-of-the-art climbing gyms and trails accessible on foot from the town center. Most recently, Chattanooga invested $330 million to become the first city in the United States to offer Internet speeds of one gigabit per second (200 times faster than the national average) to all businesses and households. In 2011, a trendy, LEED-Platinum-certified “boutique hostel” called The Crash Pad opened its doors. Catering to climbers, trail runners, mountain bikers and paddlers, it was founded by two Northeasterners, Max Poppel and Dan Rose, who took a climbing trip to Chattanooga and never left. The Crash Pad has since become something of a community hub for outdoorsy locals and out-of-towners alike. You wouldn’t have known it just a few decades ago, though. A historically industrial town, Chattanooga first earned notoriety in 1969, when broadcast journalist Walter Cronkite declared it “the dirtiest city in America” on evening news. Legend has it that businessmen downtown took two shirts to work each day, because one would inevitably grow dark with dirt and filth when the men stepped outside for lunch. By 1985, says Glover, “The city was bleeding people.” And, indeed, during the 1980s, more than 10 percent of the city’s population left for greener pastures. Glover, like many who grew up in Chattanooga, never planned on settling there as an adult. After studying International Relations and French at the University of Richmond, he dreamt of moving abroad. One reason for the turnaround is that many of the elaborate trail systems surrounding Chattanooga have only been developed in the last decade or two. Campbell jokes that, as a teenager, she was a kind of “redneck tomboy,” riding motorcycles and four-wheelers in the same mountains she now loves to run. Many of those previously motorized recreation areas have since been reclaimed by local conservation nonprofits and land trusts. Formal trails have been built, trash hauled out. Darby Marshall of Fort Payne, Alabama, having a splash on day three of the Chattanooga Mountains Stage Race. Photo by Werunchattanooga. On their road trip, the Glover boys and Himelein watched storms roll in over the Great Plains. Hammered by rains and their tents soaked, they spent a morning in a South Dakota diner writing a blog post. From there, they ventured north through the mountains of Alberta and British Columbia. 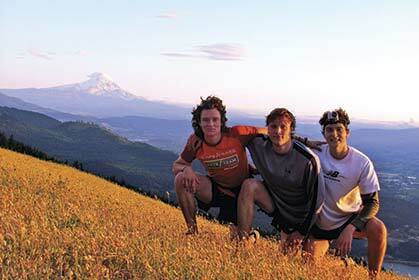 They watched sunsets over Oregon’s Columbia River Gorge and ran through redwood forests in northern California. But when it came to playing outside, people struggled with one thing: they didn’t know where to go. This reflected the guys’ own experiences on their road trip. Everywhere they had visited, they struggled to find good beta on where to trail run or hike or climb. A Google search for “best trail running Minneapolis” yielded a Yelp review for a botanical garden. They discovered within themselves what Glover describes as “a desire to help more people interact with the experiences that blew our minds and energized our daily routines.” The best info they got was from local outdoor retail shops, where shop owners or employees scribbled trail-map sketches on the backs of receipts. In San Francisco, they had a light-bulb moment: what if they created a high-quality online database of the best local trail runs, hikes, paddling routes, bike rides, rock climbs and more, curated by local experts all over the country? In 2012, Glover partnered with the Chattanooga outdoor shop Rock/Creek Outfitters, and founded a company to do just that. He called it RootsRated. Headquartered in Chattanooga, the website and app company now has 11 employees and a nationwide network of several dozen outdoor writers. While Glover is a poster child for Chattanooga’s entrepreneurial bent toward the outdoors, he stands on the shoulders of many local pioneers. 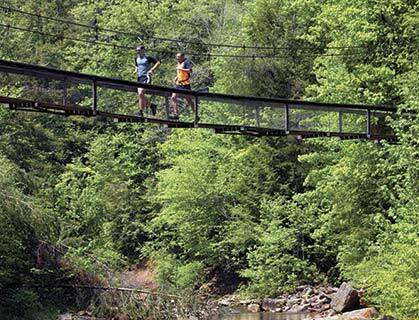 For starters, you can’t talk about trail running in Chattanooga without mentioning Rock/Creek. The outdoor shop has long employed local runners, as well as sponsoring trail races and a race team. And you can’t talk about Rock/Creek without talking about a man named Dawson Wheeler. Wheeler, now 56, is a Tennessee native graced with an amiable Southern drawl. He first arrived in Chattanooga in 1974 to attend a prep school. There, he and one of his best friends, Marvin Webb, often dreamed about starting an outdoor business—going into the woods, taking people climbing. Fast forward a decade. At age 27, Wheeler purchased a local outdoor shop called Canoeist Headquarters from its owners, who were looking to retire. Wheeler renamed the shop Rock/Creek. It didn’t take long before his childhood friend showed up at the store. “Hey, remember that conversation we had when we were sophomores in high school?” he said to Wheeler. An hour later, Webb drove back to Atlanta to tell his wife they were moving to Chattanooga. “Outdoor recreation” in Chattanooga in the early days was synonymous with rock climbing. Trail running was just what climbers like Webb and Wheeler did to stay fit. Wheeler also came from a backpacking background. Many Appalachian Trail thru-hikers found employment at Rock/Creek after coming back from the trail. 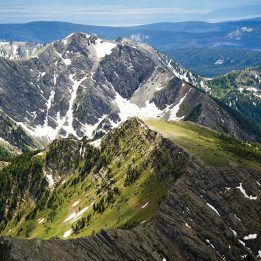 With time, “kind of like human evolution on a Neanderthal poster,” Wheeler says, they evolved from hiking slowly with really big packs to realizing that if they ditched the packs and started running instead, they could cover 30 miles of trails in a day and still sleep in their own beds at night. Back in his hometown, he began running local trails and was surprised to discover that they were empty. In the mid-1990s, only one trail race existed in Chattanooga, a small holiday event sponsored by the local track club. Sims saw trail races as a way to bring new people into a sport with which he fell swiftly and deeply in love. So, under the Rock/Creek banner, he created two of Chattanooga’s now-beloved races, the River Gorge 10.2-miler and the StumpJump 50K. 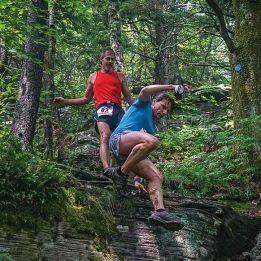 Wild Trails, initially in partnership with Rock/Creek though now as an independent entity, introduced a host of new trail races—a 10K, a trail marathon and half marathon, another 50K, a 50-miler, a 100-miler and even a three-day stage race (inspired by a 219-mile stage race the Whortons ran together in Switzerland). Among those is a rugged, “no-frills, no-weenies” race that Sims and a buddy, Chad Wamack, conceived of and continue to direct today. They named it the Upchuck 50K, after an ill-advised mid-run snack of Mountain Dew, Snickers, cheese crackers and Fig Newtons failed to sit well in Wamack’s stomach. The races’ popularity soared. So, too, did the general popularity of trail running in Chattanooga. Races gave athletes from other disciplines new goals. Running groups and organizations blossomed. When Dreama Campbell began her trail-running group, only three or four people showed up. A decade later, the group draws up to 30 people on any given night. The tide was shifting from Chattanooga’s industrial, polluted past toward a deep appreciation for the city’s natural amenities. Many locals credit one of the original conservation organizations, the Tennessee River Gorge Trust, with leading the charge. Established in 1981 and formally incorporated in 1986, the Trust protects over 16,000 acres of undeveloped forest, mountain and river just a few miles downstream of Chattanooga. In the next two decades, more conservation-focused nonprofits popped up left and right—the Lookout Mountain Conservancy in 1991, then the Lula Lake Land Trust in 1994, followed by the Cumberland Trail Conference, the North Chickamauga Creek Conservancy and others. User interest groups like the Southeast Climbers Coalition and Southern Off-Road Bicycle Association (SORBA) got involved. In 2004, SORBA’s newly minted Chattanooga chapter set a goal of building 100 miles of singletrack within 10 miles of downtown in a 10-year period. To the joy of mountain bikers and trail runners alike, and with the blessing of local land managers, they pulled it off. Impassioned trail users of every ilk pitched in thousands of hours of volunteer work to make it happen. The thing about Chattanoogan trail runners is that they’re not just trail runners. They’re also kayakers, climbers, mountain bikers, triathletes and skiers. 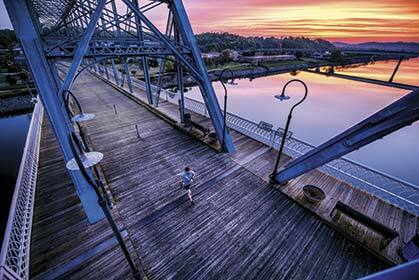 Trail running, often, serves as the entry point for people to experience everything else Chattanooga has to offer. Chattanooga has played host to all sorts of professional sporting events, ranging from IRONMAN to the USA Pro Cycling Championships. The StumpJump 50K has grown to one of the country’s largest and most popular trail races, with elite-level runners like Duncan Callahan, Kerrie Bruxvoort and Alison Bryant traveling from all over the country to compete on the Signal Mountain portion of the Cumberland Trail. “I think it’s just the whole friendly Southern vibe, like ‘You go do this with me, I’ll go do that with you,’” says Brian Costilow, a 10-time Leadville Trail 100 finisher, member of the Rock/Creek Race Team and, as of 2015, co-race director for StumpJump and River Gorge. He’s lived in mountain towns ranging from Leadville to Missoula to Chamonix, but ultimately settled in Chattanooga. The accessibility not only of the trails themselves but also of the community has ensured trail running a spot in mainstream outdoor culture in Chattanooga. It’s not a fringe sport. In the “living room” of The Crash Pad hostel, you can find recommendations specific to trail runners. 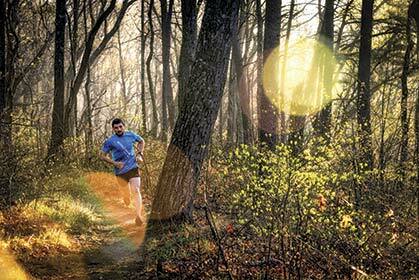 A search for Chattanooga trail runs on RootsRated yields over 50 options. After all, the people of Chattanooga are still uniformly pleased that things aren’t like they used to be. And most all Chattanoogans, it seems, are evangelists for their burgeoning trail town. “I’ve been all over the U.S. and New Zealand, playing and doing outdoor stuff, and Chattanooga is incomparable. 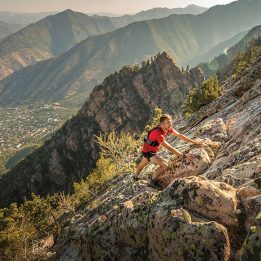 It’s amazing,” says Jim Farmer, a former New Yorker who left behind 100-hour workweeks and what he calls “too many years overeating and being a blimp” to become a trail runner, adventure racer and cyclocrosser. He was one of the early leaders of Chattanooga’s Wednesday-evening group trail runs. Everyone has a story about the friend, or couple, or even complete stranger, they convinced to move to Chattanooga. RootsRated co-founder and Rock/Creek marketing guru Mark McKnight describes himself as a walking, talking advertisement for Chattanooga. Recently, he had a friend from high school in Raleigh, North Carolina, relocate to Chattanooga with her husband. They’d seen McKnight’s Facebook posts extolling the city’s virtues. When they came through town for a short-term visit, like so many others, it turned into a long-term move. 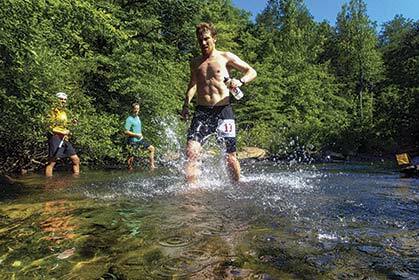 There is one rattle of uncertainty in the engine of Chattanooga’s trail-running surge, however. It’s one that mirrors a concern of the greater trail-running community: what happens when demand for a great race balloons beyond capacity? In 2014, between the 50K and 11-mile events, there were over 700 people registered for the StumpJump—up from just over 100 runners in its inaugural year, 2002. Though some embrace bigger numbers at races, higher participation inevitably increases environmental impact on the trails, and often, too, the quality of racers’ experiences. Races aside, the trails of Chattanooga remain astoundingly serene. Wildlife far outnumbers humans—coyotes, foxes, deer, bears, the occasional bobcat, and yes, plenty of snakes. Kris Whorton lives with her husband Randy at the base of Lookout Mountain. She says that no matter what time or day of the week she heads out for a run on the trail (which is accessible by multiple trailheads about 15 minutes from downtown), it’s rare for her to see another person. Kris and Randy both grew up in the mountains on Colorado’s Front Range. Not too long after doing their first ultra together, California’s Quad Dipsea, in 1995, they left Colorado for good to make a new home in the Southeast—first in Huntsville, Alabama, and later in Chattanooga. Are Chattanoogans worried that if they continue to sing their own praises too loudly, their outdoor spaces will get overcrowded, too? Or, mirroring a more nationwide debate, that too many newcomers to the sport of trail running will fundamentally alter the very things that make it special? That wildness is part of what makes Chattanooga what it is, he insists. To my initial question, though, nearly everyone else I speak with says, “Nah.” They chuckle at the suggestion. After all, Chattanooga is living, breathing proof of just that—that when people fall in love with outdoor spaces, they’ll do anything to protect them. When Glover returned to his hometown after driving more than 16,000 miles, he’d explored some of the most beautiful places on our continent. And, as he looked out over the sparkling waters of the Tenneessee River, the contoured ridgelines and hardwood forests of the Cumberland Plateau and the happy buzz of a newly vibrant downtown, he couldn’t think of anywhere in the world he’d rather live. Stringer’s Ridge: Saved by the citizens of Chattanooga from condo development in the late 2000s, this 92-acre urban park a few minutes north of downtown is packed with a roller coaster of trail-running and mountain-biking singletrack loops. Map available at trgt.org. Lookout Mountain: Reaching all the way into Georgia, Lookout Mountain boasts everything from caves to waterfalls to miles of singletrack. The 10-mile “Big Daddy Loop” is a RootsRated staff favorite, delivering stunning views along the aptly named Bluff Trail and Sunset Rock. Still Hollow Half-Marathon and 10K: This rolling, nontechnical course in the Enterprise South Nature Park is perfect for first-time trail runners. Dense forest offers plenty of shade in August. StumpJump 50K: Taking place each October, this wildly popular ultra boasts a burly 5,000 feet of elevation gain on almost 100-percent singletrack on Signal Mountain and Walden Ridge. Chattanooga Mountains Stage Race: The sampler platter of Chattanooga’s finest singletrack, with three days of racing in mid-June—18 miles on Raccoon Mountain on Day 1, 22 miles on Lookout Mountain on Day 2 and 20 miles on Signal Mountain on Day 3. This article originally appeared in our April 2015/DIRT issue.